Came across this littel app with which you can create shortcuts with which you can run the aplpication by typing the name in the Run box. The best part is you can have custom aliases. I have not tried this app myself. Hmm, I fail to see an advantage over a normal shortcut. In fact, it seems to be more cumbersome having to go via the run box all the time. Or am I missing something? Well, its the same advantage you get when you use an App Launcher. 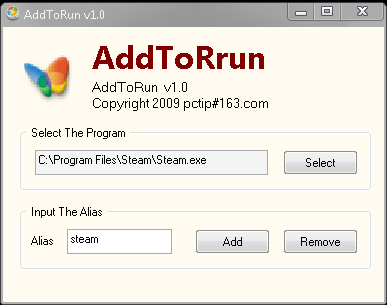 Instead of using a third party launcher, you use Run as the launcher. Also, "it seems to be more cumbersome having to go via the run box all the time" is subjective. There is a difference, I think. AppLauncher launches with one click. Typing a name into a run box is more effort - and you have to remember all the names. I have set up nearly 100 programs, websites and folders for quick launch in AppLauncher, the toolbar on top of my screen and Quick Launch (which are both "native" functions). I think I would get confused. In the facilities I use, I can tell them apart by the icons plus the display of the names. But I guess there is room for everything. thanks imav, will give it a try. I have tried this application long time back, it didnt work for me. I prefer to use the normal app launcher instead of adding commands. Thanks iMav it works fine with speech to text just what I needed. It cuts down the voice commands by 60% just what I need when I want to sit back in my chair and relax. 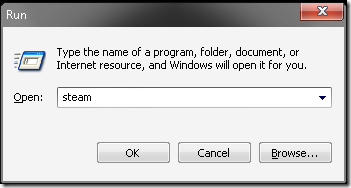 u can run any program from run using registry too..